Does your heart skip a beat every time you think about the complexities of providing cardio care? Well, not anymore! Written in the award-winning Incredibly Easy! style, this completely updated Third Edition of Cardiovascular Care Made Incredibly Easy is the ideal reference for those entering or needing a refresher in cardiovascular nursing care. 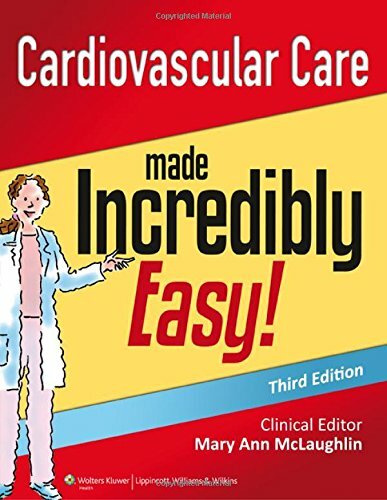 This one-of-a-kind book brings together the broad knowledge nurses need to be confident in cardiovascular care, including cardiovascular anatomy and physiology; assessment; diagnostic testing; hemodynamic monitoring; electrocardiogram performance and interpretation; medications; synchronized cardioversion; care of patients with IABP counterpulsation, ICDs, pacemakers, and VADs; and preoperative and postoperative care for patients with MIDCAB, CABG, and balloon angioplasty.